Are we indifferent to school, or is schooling indifferent to us? I have been performing my graduate observations this semester at a Mexican cultural school, housed within another larger CPS school. The cultural school was started in the 1990s by a small group of artists, teachers and community members local to the immediate neighborhood. It was founded with a focus on small class size and arts-based curricula, all with an emphasis on Mexican/Xican@ culture and history. The school is completely bilingual, and most of the teachers and staff are Xican@ and fluent Spanish speakers. Yet of all the truly remarkable things about the school, one of the most notable, and rare in any CPS school, is the constant presence of parents and other adult community members throughout the school day. The school houses an adult learning center on its first floor. This unique organization, though it exists as a nonprofit independent of school funding, was founded by teachers, parents and community members only a few years after the school itself was created. The catalyst for the center’s beginning was a recognition on the part of parents and community members that none of their families’ educational needs could be met if other immediate threats to their health and wellbeing were not actively and simultaneously addressed. The neighborhood in which the school is located is largely poor and working-class, and is home to a large number of recent and undocumented Mexican immigrants. The parents who founded and continue to staff the center advocated for GED, English language and basic literacy courses–all the things they understood to be necessary for their own survival in the local economy. They fought for funding which could provide free classes, and free childcare during those classes–a complete necessity to making their own learning possible. In 2012 the center is staffed by volunteer and partially paid parents and community members, and serves around 300 adult learners weekly, from neighborhoods all over the west side, with and without children in the local schools. It features all the original courses, plus dance, aerobics, and workshops on understanding rights and protections for immigrant communities. The center also actively refers those in need to trustworthy legal and financial counselors, and provides emergency resources for any families struggling with bills or other basic requirements. As a result, an incredibly vibrant adult learning community exists in the school space, and parents and families are familiar and welcome in the school at all times. In my years as a tutor, school staff member and student of education, I have heard it bemoaned on innumerable occasions (usually by wealthy and/or white educators) that poor and Brown parents are completely uninvolved in their children’s schools, and actually do not care about their children’s education. These frustrations are usually expressed based on white, middle-class markers of parent involvement–joining the PTA, chaperoning and organizing school events, fundraising, and showing up to teacher conferences. The idea that parents who don’t exhibit some or all of these behaviors are indifferent about their children’s futures is, of course, culturally biased, and a failure to recognize the mountain of reasons why poor, working, immigrant and Brown people may be unable or unwilling to participate in their kids’ schools in such ways. Yet aside from being deeply bigoted, this accusation misses an even larger point: That the greatest advocates for the education of oppressed communities have always been the allied members of those communities. In his recently published piece The Struggle for Black Education, Brian Jones notes that claims that Black parents are uninvested in their children’s learning are particularly ludicrous and offensive. Not only have Black parents fought harder than anyone in U.S. history for the educational rights of Black kids, but, Jones argues, they have also been key pioneers in the formation of U.S. public education itself. From underground schools and lessons held during slavery, to the demand that the state provide funding for schools for ex-slaves during reconstruction–a novel idea at that point in U.S. history. 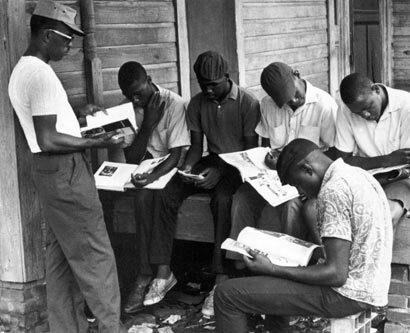 From freedom schools in the Jim Crow south, to the battle for integration across the nation in the 1950s and 60s–a struggle which Black communities understood to be as much about a redistribution of resources as equal access to quality education. Only this last Friday, I joined several hundred Black and Latin@ parents and community members in a vocal rally outside of the Chicago mayor’s office to protest the forced closings of up to a hundred neighborhood schools, proposed by the Emanuel administration for the coming school years. Similar legacies of struggle exist in virtually every ethnically, culturally, geographically and economically oppressed population in U.S. history, and continue into the present. The notion that any demographic of parents doesn’t care about its kids should be fundamentally questioned, but especially when said demographic has advocated for its kids over generations in ways that business, the state, and the classes who control them never have. I believe that what the model at the school in which I am observing suggests is not a unique commitment on the part of a particular group of parents, or the clever organizing of administrators or policy makers. Indeed, members of this adult learning program are adamant that standard school models which try to incorporate adult learning are based entirely on “student achievement”–meaning standardized test scores and college entrance–and incorporate parents not as esteemed community members but as poisonous influences who need reprogramming on the part of middle class educators. What makes this model special is that it is community designed, created and controlled, and that it understands the learning needs expressed by every member of that community to be necessary for building a truly inclusive and effective learning model–for every student, in every capacity, at every age. Instead of bewailing the lack of parent and family involvement, educators may want to ask how current models of education conceal the ways in which parents are deeply involved in their children’s learning, and how traditional schooling may stand in the way of meeting the real needs of oppressed communities. The reasons that oppressed parents hold colonial models of education at arms length are the same ones which alienate, dissolution and disrespect oppressed students. When we as communities control our own classes, our own learning spaces, and determine for ourselves on a local level what an empowered and relevant education should look like, I think it highly unlikely that we will be accused of being lazy, absent, or indifferent again.